Std Prodrive springs as a recommendation ,also designed with uk roads in mind. Forget the look / stance i have a type r and i think the standard jdm sti springs are perfect for the car. Some will say different but subaru put a lot of r+d into the standard set up and o think it works really well, it has a good ballance between firmness and drivability and unless you are going to track it or there is somthing wrong with the springs i suggest you look at antiroll bars drop links and antilift kits as well as a good geo set up before you change the springs because of the look / ride . Handling is king and when you get used to it the suspension works quite well out of the box for normal day to day driving as well as the odd spritted weekend blast. Measure your wheel centre to metal arch distances. It's often the lowering of the car onto its bump stops, that causes the problems. I assume you've got inverted struts? The lowered WR15R/T springs are the correct spring rates and come with matching bump stops. The P11L springs are 6mm lower at the front than the P1 (same as Prodrive WR97/98) - ride heights: 335mm front, 340mm rear (+/- 5mm depending on fuel level). Inverted struts have a higher static gas pressure, if new, might be 5mm higher. The matching bump stops will depend on which struts you have. Last edited by 2pot; 29 May 2017 at 09:38 AM. Ok 2pot. I cant quite see them on the ground but the fronts are red in colour. Is there a nut on the base of the struts? 335mm at the front is OK, but the front bump stops will have to be changed. 320mm at the rear is too low. Last edited by 2pot; 30 May 2017 at 12:08 PM. Ok. I think there is a nut. Just back from tyre shop but didnt watch them work. All balanced now and tracking off. No vibes at 80 and feels fast in the bends but not totally stable for me. Will try the tyre pressure drop at rear. Nut at bottom is for fitting the damper or does a new damper come fitted with a strut for Scoobies? Nut at the base indicates an inverted strut - which dictates the bump stops you need. 2 pot. Still looking at some new springs. Hitting stops as soon as she sniffs a pothole. In summary, whats the difference in ride and stance compared with the standard Subaru RA springs I could buy from Import car pars for my red shocks. Are they harder or softer but longer. Interested in getting the standard firmness or more flexible spring for these really rough roads. I carry passengers as well in the rear from time to time and dont track it. I have tried both the OEM red springs and P1 springs on a MY99 WRX RA. The OEM items will be a lot better than what you have now, but the P1 springs are on another level. Ride height is roughly similar but the compliance they bring will transform the way your car drives, while still feeling controlled and not overly "soft". What are the spring part numbers? Thanks a Plenty! Got under it yesterday. Not easy as its low. The front springs I have are black and branded 'Prova'. Both lower ball joint boots are split so this could be the source of my vibration under braking and what sounds/feels like bottoming out on hard bumps? I'm not sure if its anything to do with my high speed vibes though. Will change. 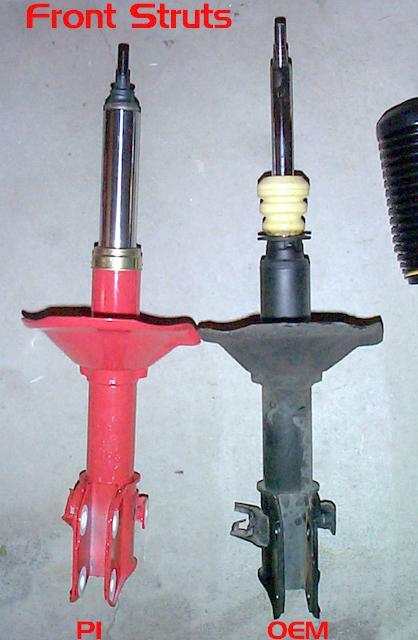 I have the red shocks, are the bump stops inside the body as I couldnt feel them at the top of the damper rod? I also have a 'Cusco' branded blue alloy brace between the lower control arms. Any good? Plenty, When you say 'compliance' what do you mean? You mean good all all situations? Soft when needed and firm when needed ,if that makes sense? It's likely you'll have the OEM KYB inverted dampers with the internal bump stops. By compliance I mean composure over imperfect roads. My old MY99 WRX RA with P1 springs, Prodrive Bilstein dampers, standard ARBs and drop links and 50 section tyres was *the best* setup I have ever owned on any car for hooning down a typical bumpy, pockmarked British B-road. It would stay ruthlessly planted, absorbing the bumps while staying totally controlled and inspiring a massive amount of confidence. The P1 spring was actually designed for the OEM KYB damper so you should experience a huge improvement. It is slightly softer than the JDM spring but not too soft as to ever feel wallowy. Thanks. I have the red thicker dampers upfront (original spec??). Should the rears also be red?